Supreme® was developed for extra large square bales. With its high visibility colour, contamination in feeding machines can be eliminated. You can be sure to have consistency from year to year with Kinnears Supreme®. 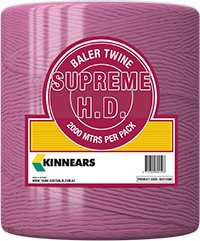 High tensile strength twine with super knot holding ability. Product consistency from season to season. Bright pink in colour for excellent visibility on and off the bale.